Tuck Shop Geylang – finger food with truffles | Is Life a Recipe? Funny story, but short story. I played football for Ollie’s old school last night, and as usual we scoot back to Tuck Shop, Geylang. I was last to leave and went to pay. Completely forgot I had given Mary my other card this am to go to ATM to get some cash. Now I realise this place does not accept Amex and my other UPB card is not working – whoopsy. So I had to leave my UOB card there, give some ID to verify it is me, and commit to be back today to pay off the invoice. Now I love this place. It reminds me of London bars, with full open shutters, seating outside and archipelago beers and ciders. It’s just a chilled out and uber cool place. Now because I love it, of course I would not be scamming them. So back at 330pm today to settle the bill, but also to take Mary and the kids to show them the place too. Here it is – right on the corner, al fresco drinking and eating will cool sounds a pumping. NICE!!! 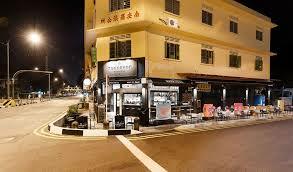 Lor 36 I think it is in Geylang on a corner of main road and the Lor. It gets busy to get there early or book ahead. Oh yeah and back to the picture. Try the food. We just grabbed a wee toffee apple cider and some bar snacks as per the photo. 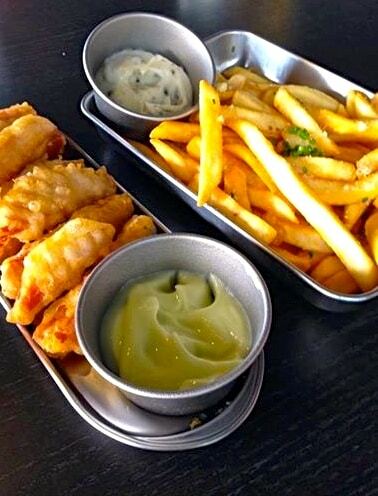 Item on the left is ‘spam fritter with wasabi mayonnaise’ – COME ON, deep fried spam in batter is GENIUS!!! Item on the left is fries. BUT ‘fries fried in truffle oil, sprinkled with parmesan and parsley, served with truffle mayo’ – COME ON PART DEUX, you have to be kidding me. Potentially the most decadent chips I have ever had. They are simply to die for and a must for any visitor to Lunch Box. It’s cool, it’s hip, it’s well worth a trip. No Replies to "Tuck Shop Geylang - finger food with truffles"